I am not suggesting Smurfette sleeps around or is immoral in any way. But I do wonder this: How in the world do Smurfs mate? As Smurf folklore goes, 100 Smurfs exist with one being female - Smurfette. ... WTF? Because of the differentiation in sexes, it makes me assume Smurfs mate, and Smurf babies are conceived, like humans. Does that mean Smurfette gave birth close to 100 times? Was there another female Smurf who gave birth to Smurfette's contemporaries? A ton of theories exist on this question, but when going straight to the source (as any quality journalist does), no succinct answer exists. The source, by the way, is either the Belgian artist Peyo, who created the Smurfs in 1958, or Hanna-Barbera, which produced the Smurfs TV show from 1981 to 1990. 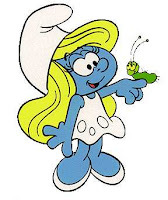 By George, my research shows that a Sassette Smurfling also existed, but she was born after Smurfette. She has a slight Southern accent and has red hair. ... Good God. I believe any good story also needs a good back story. I am not convinced that exists with the Smurfs. I don't feel the mystery of Smurf mating will ever be solved, but through this all, I did run across a list of the 69 named Smurfs of the 100 Smurfs. Some of the names blow my mind as the list includes Pastrycook Smurft, Pretentious Smurf and Reporter Smurf. Thanks for the positive comments in my world--and right back atcha!! (I've only been able to read a few of your posts, thus far, but we are clearly burdened with many of the same issues, burning through our cerebral cortexes on a daily basis...how is it possible that we continue to survive and/or thrive in a universe that doesn't grasp the perpetual mountain of stress we are forced to manage?!!). It's a curse, being as attuned to the universe as we obviously are.